These apex predators returned to the North Cascades 10 years ago. Are we giving them a fair chance? Winter is not my favorite season. I lived in Vermont for too many years to get excited about snow, and I don’t like having to brace myself to walk out the front door. But today was different. Today I was on a scientific mission – more of a pilgrimage, really – and the impressive tracks at my feet trumped the raw, westerly breeze biting at my face. Each symmetrical print showed four toes and pronounced claws, like that of a coyote, only much bigger. Maybe a dog out for a walk? I wondered. No, the gait was too steady, the trail too straight. Besides, these paws would put a German shepherd to shame. I smiled at my husband, Robert Long, whose satisfied grin transcended his curiosity as a biologist. We were both relieved the Teanaway wolves had survived their first year. A wolf track in the snow. This paw would put a German shepherd to shame. When we relocated to central Washington in 2007, the dry, dusty terrain challenged my sensibilities as a native New Englander. Our new hometown was surrounded by windblown hills that seemed hostile and barren – an inhospitable moonscape of sagebrush and grass. This was the Pacific Northwest, for heaven’s sake; where were the rhododendrons, the drippy mosses, the giant Douglas firs? Then I discovered Teanaway country, a surprisingly fertile place on the eastern flanks of the Cascade Range. The region’s namesake, the Teanaway River, is a tributary of the Yakima, which in turn flows into the Columbia – the largest river on the continent draining into the Pacific Ocean. Clear as a desert sky and cold enough even in June to make my bones ache during stream crossings, the salmon-supporting waters of the Teanaway are spawned by snowmelt from the adjacent high peaks. Although the Teanaway valley floor is peppered with homesteads, the abutting forests and alpine meadows are tantalizingly wild. 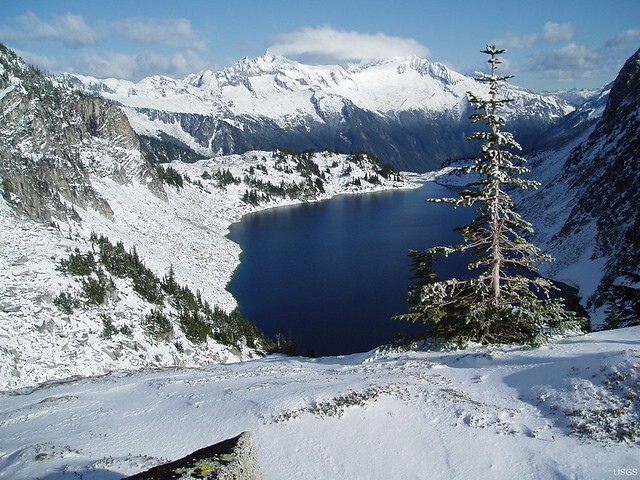 To the north lies a vast stretch of national forest and other public lands crowned by North Cascades National Park. To the south, more national forest – broken by clearcuts and Interstate 90 – and Mount Rainier National Park. All told, the North Cascades Ecosystem, which runs from I-90 to British Columbia, covers an area larger than Yellowstone, Glacier, and Yosemite National Parks combined. Other than the northern Rockies, nowhere else in the contiguous US offers so much room for wide-roaming carnivores. And for people like me who yearn for wilderness. Your donation to Biophilia Foundation helps us continue projects that create wildlife corridors for wolves. 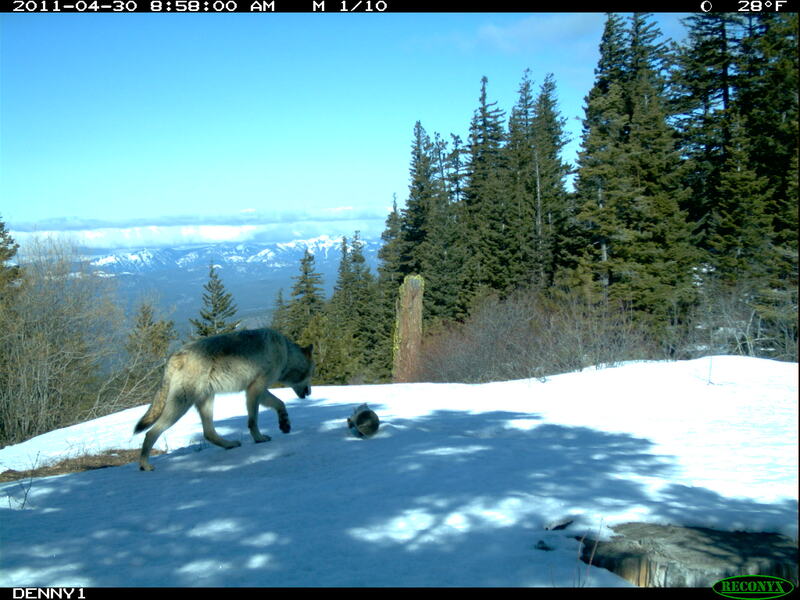 Robert and I were part of a research team that helped deploy motion-triggered wildlife cameras in the Teanaway in early 2011, soon after evidence of wolves began to surface. 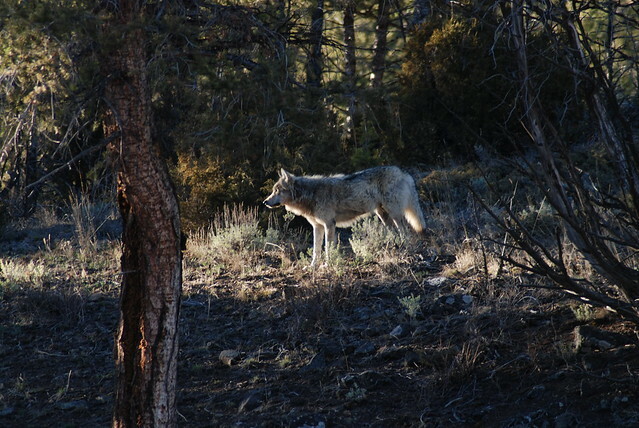 Local residents had reported numerous wolf sightings, and volunteers had photographed a large canid during their camera surveys the previous fall. When follow-up efforts yielded images of at least three adult wolves, the Teanaway pack became official. By summer, government biologists had documented an additional four pups. On this mid-February afternoon, we were visiting the Teanaway to learn more about how the wolves were using their new territory. 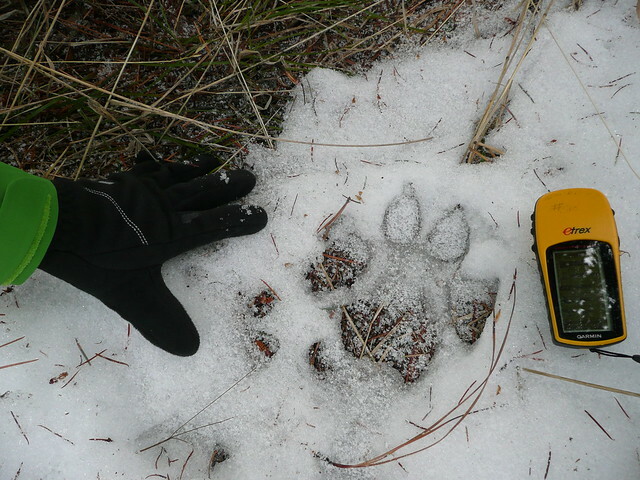 Washington’s Department of Fish and Wildlife was monitoring the pack with radio telemetry, but Robert and his graduate student wanted to collect sign on the ground. My own goals were more complicated, reflecting my dual career as a field biologist and a writer. As the icy logging road crunched beneath my boots, I strived to imagine my surroundings from the perspective of a wolf. Weathered firs and pines dotted the arid slopes, heavily traveled by mule deer and elk. The brushy creek drainage below provided cover for predators and prey alike, while the ridgeline above afforded an expansive, 360-degree view. By late spring, the Teanaway’s meadowlands would be loud with glacier lilies, purple lupines, and exuberant hikers eager to get out on the trails again. But in winter, this was mostly a quiet place. Only the hum of a distant snowmobile reminded me we weren’t alone. My forward momentum was interrupted when I noticed one of the two sets of tracks we’d been following splitting off to the left. “I can’t resist!” I called out to my companions before heading downslope alone. Soon I found myself jogging alongside the trail of a loping wolf. I was practically giddy as I leapt from print to print imitating the animal’s stride: So THIS is what it’s like to run like a wolf! Until I heard the howl. I skidded to a halt. Scanning the trees in front of me, I tried to trace the sound to its source, which seemed alarmingly close to where I stood. In my rational mind, I’m far warier of people than wolves, who practically never attack humans. But in the moment, I was reacting from a more primal place, a place where I no longer fancied myself queen of the food chain. As David Quammen wrote in Monster of God : “For as long as Homo sapiens has been sapient – for much longer if you count the evolutionary wisdom stored in our genes – alpha predators have kept us acutely aware of our membership with the natural world.” My genes were reminding me I’m made mostly of meat. Partway into the second howl, the adrenaline hit me like a double shot of espresso. The wolf was now directly behind me – how could that be? I spun around to face my stalker and was chagrined by what I found. The howls were coming from my own goddamned backpack. My sister was calling me on my cell phone. Her ringtone? A Mexican wolf. Once I shook off the embarrassment, I couldn’t help but feel elated. With I-90 visible on the horizon, there were wolf tracks next to mine. Robert and I had traveled that very highway across the country less than five years before to start our new life in Washington. At the time, I wouldn’t have believed I could be in the company of wolves today, as they’d been gone from the state for several decades. Suddenly, they were here again – why now, nobody knew. The Teanaway wolves were the second pack to recolonize the Cascades. Genetic tests indicated the Teanaway’s alpha female emerged from the Lookout pack about 100 miles north of us. She was lucky to have gotten away. Photo courtesy of USGS As in the rest of the American West, wolves were eradicated from Washington during the nineteenth and early twentieth centuries. Then a decade ago they were spotted again near the North Cascades National Park (pictured left). Wolves were no more a reality of my early childhood in Boston than were witches, talking tigers, or any of the other make-believe characters I encountered in coloring books and cartoons. Like most kids, I was drawn to animals at the zoo, but the concept of living among them was as foreign to me as the suburbs, where I was ultimately to pass my painful adolescence. Not until moving to Vermont as a young adult did I begin to feel the seduction of wildness, which beckoned me to its loneliness like the open sea beckons a sailor. In Vermont, I discovered the thrill of seeing scars left by black bears on the smooth bark of beeches, of hearing barred owls squawk like howler monkeys at dawn. Still, something was missing. The more I learned about our long lost wild predators, the more our hardwood forests felt tame. Wolves and cougars were gone from the Green Mountains – gone from the entire Northeast. After becoming a professional conservationist, I became involved in efforts to bring them back. But I got tired of chasing ghosts. Washington has its phantoms, too. Pacific fishers were reintroduced to the Olympic Peninsula and Mount Rainier in recent years but remain absent everywhere else. The fisher’s brawnier cousin, the wolverine – eliminated by trappers by the mid-1900s – has only recently reappeared from the north. Grizzly bears are a ghost story unto themselves, with the last known grizzly in the Cascades legally shot by a hunter in 1967. A few grizzlies inhabit the “Wedge,” a hearty slice of forest sandwiched between the Kettle and Columbia Rivers in the northeast corner of the state. But despite occasional sightings, grizzlies have yet to repopulate the North Cascades (though they are currently the subject of a proposed federal restoration plan). As in the rest of the American West, wolves were eradicated from Washington during the nineteenth and early twentieth centuries – slaughtered for their fur and persecuted for being predators in emerging sheep and cattle country. They were trapped. Shot. Burned. Poisoned. Pursued with such abandon that no den was left unscathed. Most of all, wolves were killed for being wolves. From 1821 to 1859, nearly 15,000 wolves from the Pacific Northwest lost their hides to four Washington-based trading posts. Only a scattering remained by 1900, and when they were found, they didn’t last long. As many as 5,000 wolves once inhabited the landscape we’ve come to know as Washington. A century after Lewis and Clark reached the West Coast, their howls fell silent. The story as I know it picked up again with six wolf pups photographed in a forest clearing. Three months old, coated in fuzzy tan and gray, they were all legs and ears and curiosity. Five of the pups explored the world around them. One poked at the grass with its paw, two sniffed the soil next to a stone. Maybe a sibling had peed there, or a bobcat left its mark for the new kids on the block. The sixth pup relaxed, its black-tipped tail and lanky body sprawled lazily across the ground. The pups’ mother and father – the pack alphas – were probably out hunting for food. Life was good at the rendezvous site. This image, recorded in 2008 by a remote camera east of North Cascades National Park, helped confirm the first breeding wolves known to inhabit Washington since the 1930s. That same week, the pups’ parents were radio-collared by state biologists, who determined the Lookout pack (named after nearby Lookout Mountain) included at least two more animals. The pack’s alpha male was related to wolves in British Columbia. Like the Teanaway’s alpha female, he had ventured south in search of a new home. Many Washingtonians gave the Lookout wolves a hero’s welcome, like they were veterans returning from a long-forgotten war. Polls showed that three-quarters of the public supported the return of their top-dog predator, and wildlife officials scrambled to finish a wolf recovery plan for the state. Meanwhile, wolf sightings in northeast Washington increased, with another pack, christened the Diamond pack, confirmed near the Idaho border less than a year after the Lookout wolves made their public debut. But just as we were celebrating a new era for wolves in the Pacific Northwest, the story turned darker. It was Christmas season, five months after the Lookout alphas were collared. The Federal Express counter in Omak, Washington, was no doubt abuzz with activity. Clerks would have come to work expecting the usual holiday madness as shoppers dropped off gifts for loved ones far afield. But one of the packages didn’t look right. The box was dripping blood. According to the indictment, police confiscated the package and found a wolf hide inside. The hide once belonged to a member of the Lookout pack. With photos, emails, and other grim evidence, investigators pieced together the illegal killing of several Lookout wolves between May 2008 and January 2009. Three people – a father, his son, and the son’s wife – were charged with the crimes, which took place near their residence in Lookout territory. The pelt in the box was destined for tanning in Canada. This high-profile case dragged on for years. Finally, in July 2012, the wolf killers were prosecuted, fined, and put on probation. That was the human toll. The wolves, guilty only of choosing the wrong neighborhood for rearing their young, paid a much greater price. By early 2009, the Lookout pack had been reduced to the alpha male and female and one yearling; the other pups from the photo had perished. Four more pups were born in the spring, but things continued to unravel for the wolves. That fall, an unidentified male wolf was found shot and skinned along Highway 20, the main road through North Cascades National Park. Then, in May 2010, the Lookout pack’s alpha female suspiciously disappeared. She’d been seen pregnant in April, but her pups were also presumed dead. Not surprisingly, the alpha male began to range more widely. Maybe he was looking for his mate. Or maybe he just had to keep moving. In the spring of 2013, a lactating female wolf was documented in Lookout territory – the first indication of pups there in four years. The pack’s legacy of perseverance was also carried forth in the Teanaway, where a second litter of pups was born in 2012 and a third a year later. In typical wolf fashion, some members of the expanding Teanaway pack dispersed, with one of them helping to establish the Wenatchee pack to the east. Another yearling female roamed farther from home. She was formally known as WA-015F. I’ll call her Lupa. I experienced my first wild wolves during a visit to Yellowstone. As newcomers to the park, Robert and I had joined the caravan of veteran wolf watchers who cruised the Lamar Valley every day. We saw more than a dozen wolves from the road, even witnessed a coyote harass a small female wolf until she squatted to pee and then left the area in what I could only interpret as disgust. But the highlight came late one afternoon when we were driving back to the park’s gateway town of Gardiner. Photo by Paula MacKay The author saw her first wild wolf in Yellowstone National Park. Several cars had pulled over onto the shoulder. Robert jumped out to investigate and soon came sprinting back to get me. “A black wolf – come quick!” he said, grabbing his camera from the front seat. Moments later, peering through my binoculars, I spotted a sleepy black wolf lying on a rock. Downhill, flanked by ravens and magpies, a couple of coyotes were feeding on a dead elk. They had apparently taken the wolf’s place when she’d had her fill, observing her nervously while they ate. The coyotes abruptly shied off the carcass as a smoky-gray wolf entered the scene. He had a thick, luxurious coat and was wearing a radio-collar. The wolf extracted various organs from the elk, taking particular interest in the shiny red liver. He was highly selective, like a butcher choosing the best cut of meat. Must be the alpha, I thought. The black wolf began to howl. She had risen to her feet on the boulder, her blood-splattered muzzle lifted high toward the sky. Another wolf accompanied her from behind the rocks, and the two were joined by a third. The alpha male stopped eating. He stepped away from the elk and sauntered uphill to the black wolf before he, too, raised his voice in song. Together, they howled for a full 30 seconds. Not demons. Not demigods. Just wolves. With modern technology, we can collect heaps of information about wolves. We can even fit them with GPS collars and track their movements from satellites circling the Earth. But despite all of our tools and efforts and knowledge, we will never understand what compelled Lupa to leave her territory one winter’s day. A month after we tracked the Teanaway wolves in the snow, Lupa had life-or-death choices to make. She could head south, across the formidable I-90 and toward Mount Rainier, into what was considered some of the best vacant wolf habitat in the state. She could travel east or west, but either would bring her closer to people and farther from potential mates. Or she could go north – far north – toward a place with more wolves. And that’s what she did. After leaving the Teanaway, Lupa eventually reached the edge of Lake Chelan – the third-deepest lake in the country – and plunged into its frigid waters. She continued north when she emerged on the other side, passing just east of Lookout territory. At some point, Lupa crossed the Canadian border and entered British Columbia’s Okanogan Valley, where she traversed the scenic Crowsnest Highway. She then skirted Okanagan Lake before heading northeast and swimming again, this time across the Columbia River. Finally, she turned back toward the south – thus sealing her fate. Lupa traveled some 575 miles in 2 months, only to be shot by a farmer north of Kootenay Lake in British Colombia. A spokesman for the US Fish & Wildlife Service said her skin would be used in an educational display to teach people about wolves. Although Lupa’s voyage was remarkable by human standards, it wasn’t unusual for a wolf. Reports of long-distance dispersals are becoming increasingly common given advances in tracking equipment. In 2009, a yearling female from Yellowstone traveled 3,000 miles in 6 months before she was illegally poisoned in Colorado. Another wolf, dubbed OR-7 – born in northeast Oregon also in 2009 – left his natal pack in September 2011, crossed numerous highways and Oregon’s Klamath River, and arrived in northern California just before the new year. There hadn’t been a wolf confirmed in that state since 1924. Unlike Lupa and the Yellowstone female, OR-7 is still on the move. Young wolves, like people, disperse to find new territory and potential mates. But a lone wolf is a vulnerable wolf, and traveling in today’s crowded world can have lethal consequences – as Lupa discovered when she chose to go north in search of who knows what. There’s no doubt she was on a mission. Mountains couldn’t stop her. Water couldn’t stop her. Political boundaries couldn’t stop her. Not even highways could stop her. There was but one insurmountable barrier between where she was and where she wanted to be. It looked a lot like you and me. The purpose of Washington’s Wolf Conservation and Management Plan is to “ensure a self-sustaining population of gray wolves in the state and to encourage social tolerance for the species by reducing and addressing conflicts.” There is a widely held assumption among management agencies that killing wolves accused of preying on livestock promotes tolerance among ranchers. Whether or not this assumption is valid is a matter of heated debate in the conservation community. Research suggests government-sanctioned killing may actually convey that wolves don’t have value, thereby serving to decrease the acceptance of wolves. A lone wolf from the Teanaway pack. Some scientists have questioned the extermination of wolves as a means to reducing human-wolf conflicts. Some scientists have questioned the extermination of wolves as a means to reducing human-wolf conflicts. Wolf packs are highly social entities whose members each play a role in helping the family survive. Wolves that are protected from hunters and poachers – like those living in Yellowstone – tend to form complex, intergenerational groups led by a breeding pair (usually the alphas) and accompanied by young pups and animals born in previous years. More experienced wolves teach younger ones how to hunt wild prey and stay out of trouble; without the leadership of elders, packs fall apart. Only a few years passed before Washington’s recuperating wolf population tested the limits of human tolerance. In 2012, state fish and wildlife officials gunned down a total of 7 wolves in the Wedge, where 16 cows had allegedly been injured or killed by wolves. The ranchers involved wanted the wolves gone, and so it would be. One by one, members of the Wedge pack were “lethally removed” by aerial sharpshooters. I can’t erase the scene I’ve conjured in my head. The wolf hears the helicopter before he sees it. He’s running fast, but can’t seem to shake the shadow of the noisy machine overhead. A man hangs out the door looking for a clean shot. He’s weary, too, as they’ve killed five wolves in the past two days. The wolf glances up at the helicopter one last time, his pace beginning to slow. He hears the bullet at about the same time that he feels it. Legs spin out from under him and he rolls head over tail before coming to his final resting place. The alpha male – the leader of the Wedge pack – is dead. He’s the last known family member to die. The rugged, heavily wooded terrain of the Wedge is a notoriously challenging place to raise cows. I imagine it’s also a difficult place to avoid cows if you’re a wolf. Although most wolves never develop a taste for livestock, attacks on cattle are likely to happen once in a while when they share wild country. The fact that wolf depredation doesn’t occur more often is a testament to the wolves’ restraint (consider how most people behave at an all-you-can eat buffet). According to the US Department of Agriculture’s (2011) Cattle Death Loss report, 5.5 percent of cattle losses in the US are attributed to predators, and wolves statistically fall well below coyotes, cougars, dogs, and even vultures as a documented cause of death. The same report indicates that the vast majority of cattle succumb to health-related issues and bad weather. Beyond the slaughterhouse, that is. Wolves are wild wanderers. That’s how they live and that’s how they die – too often at the hands of humans. But are wolves truly wild if they’re not allowed to roam free, or if they’re penalized for ignoring abstract human boundaries? Beginning with the Wedge pack in 2012, Washington Department of Fish and Wildlife has killed a total of 18 “problem” wolves in Washington since wolves returned to the region – 15 of these on behalf of the same cattle operation. I know there are no simple answers when it comes to co-existing with large carnivores; if there were, we presumably wouldn’t have eradicated them to begin with. I only wish we would ask harder questions of ourselves than we do of the wolves, who are giving us a second chance to act as peaceful neighbors. To be sure, there are reasons for hope in Washington. Wildlife officials currently report 20 wolf packs residing in the state, and wolves continue to recolonize their former habitat. Numerous ranches have employed range riders and other non-lethal strategies for reducing conflicts with wolves, who have now re-established themselves in the Wedge. On I-90, wildlife bridges and underpasses are being constructed to facilitate the north-south movement of animals through the Cascades; it’s only a matter of time before wolves will make their way further into human-dominated landscapes. When they do, will we have the courage to let wolves be wolves? Late summer now, and Robert and I are camped with another biologist in the backcountry of North Cascades National Park. We’re searching for grizzly bears on this trip, but our colleague has a different predator on his mind as we prepare to sit down for dinner. He walks over to a rocky outcrop and gazes into the darkening basin below. After cupping his hands around his nose and mouth, he releases a spot-on wolf song that penetrates the mountain stillness and echoes through the valley. The mere possibility that wolves could be out there listening brings wildness to this place. In the emptiness that follows, I wait, willing the night to answer. Paula is a freelance writer/editor, field biologist, and communications consultant for conservation. For the past two decades, she has studied wild predators with her husband, Dr. Robert Long. Paula served as managing editor for Noninvasive Survey Methods for Carnivores, and earned an MFA in creative writing from Pacific Lutheran University in 2015. She has written for numerous nonprofits, books, journals, and magazines — including Wild Hope, Washington Trails, The Bark, E Magazine, Wild Earth, and Wildlife Conservation. MacKay currently manages Wildlands Network’s blog Trusting Wildness, and is writing a conservation memoir about searching for wolverines and grizzly bears in the North Cascades.